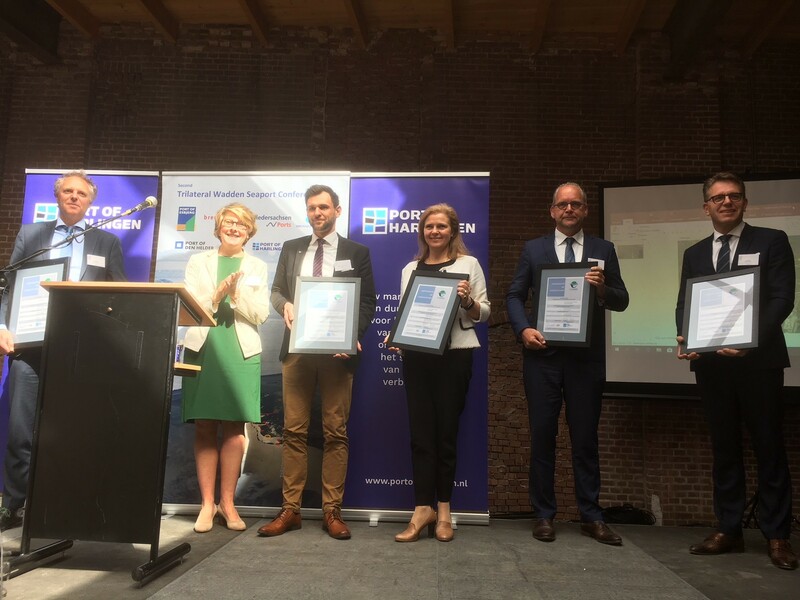 ESPO congratulates the ports of Den Helder (Netherlands), Harlingen (Netherlands), Groningen (Netherlands), Den Oever (Netherlands), Niedersachsen Brake (Germany), Niedersachsen Cuxhaven (Germany) and Niedersachsen JadeWeserPort (Germany) for obtaining EcoPorts’ environmental performance standard (PERS). The PERS certificate was handed over to the ports during the Trilateral Wadden Seaport Conference on 17 May in Harlingen by ESPO’s Secretary General, Isabelle Ryckbost. “I am delighted to congratulate seven Wadden ports for obtaining PERS and to see that EcoPorts has played a role in bringing these Wadden ports together to work on the protection of the precious Wadden Sea environment. The PERS certification is a quality mark for their environmental management. It gives ports a pat on the back for being ready to address the environmental challenges, being transparent in communicating their environmental policy and building an even closer relationship with port cities’ communities. Consumers and shippers are paying more attention to greening the supply chain,” says ESPO’s Secretary General, Isabelle Ryckbost. “The steady increase of the ports certified with the PERS standard indicates the readiness of ports to improve their environmental management, build an even closer relationship with port cities’ communities and enhance their market reputation. We encourage all ports to join EcoPorts and obtain the PERS standard,” says the EcoPorts coordinator, Sotiris Raptis.